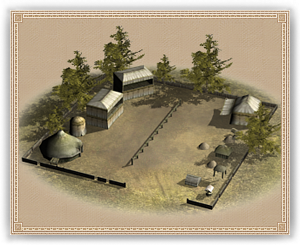 A Tourney Field improves the quality of knights recruited here, and allows an extra militia unit at the castle. Due to the overwhelming popularity of the jousting tournament, and the immense honour bestowed upon those who fare admirably in them, most capable cavalrymen throughout the human realms of Middle-earth savour the chance to practise with a lance. Lords that construct a simple set of Jousting Lists can expect to see his men putting in extra hours in the saddle, and more volunteers for the militia forces.